In an unexceptional strip of concrete warehouses, tucked amid the apparel stores and wholesale suit shops of downtown Los Angeles, a group of Jewish men meets several times a day — to pray. For 40-year-old Oded Somech, an Israeli textile importer, a midday daven is a welcome respite from the grind of the textile industry. He praised Rabbi Moshe Levin of Chabad of Downtown East for providing this sanctuary. Most of Levin’s congregants live in West L.A. or in the Valley and attend Shabbat services closer to home. But on a weekday morning or afternoon, driving west for Shacharit or Mincha isn’t really an option. So they trickle into this small room, which fits a dozen and a half chairs, and put on a tallit and tefillin and flip through their prayer books, reciting the ancient Hebrew prayers together. “That’s really what Chabad has done, is to create these little pockets of community within this fragmented area,” Levin said. The services are held on Griffith Avenue in the shadow of the I-10 freeway overpass in a room that’s part of the headquarters of 26 International, a wholesale clothing company owned by Moti Reuben, an Israeli businessman. (Twenty-six is the numerical value for the Hebrew name of God.) Levin said there’s a deal in the works to acquire a permanent space for prayer. Sometimes Levin comes to people’s offices for a pre-Shabbat prayer service, to put on tefillin and study Torah. His services bring together Persian, Israeli and a few Ashkenazi Jews. Avraham Zakaria, who co-owns a textile company with his three brothers in downtown L.A., said that when Levin first started offering prayer services a decade ago, they’d spend an hour a day on the phone trying to pull together enough people for a minyan. Now, he said, it’s common to have more than 50 people show up every day for a prayer service. “People who have family issues, they come to Rabbi Levin. People who have questions about faith, they come to him. A lot of people from USC come, a lot of young people who live downtown come over. It’s been a blessing. It’s like an island of spirituality in the middle of a desert,” Zakaria said. One of those young people is Mendel Valensi, a marketing student at Yeshiva University. He’s working for his parents’ accessories company for the summer. “It’s a good environment. I like the people here. Also, we’re so close, so it’s so convenient. We come right before lunch, pray, then go get lunch. The timing is perfect,” Valensi said. In addition to services in downtown L.A.’s Garment District, Levin holds regular midday study sessions he calls “Lunch and Learn” at the California Market Center. “It’s not only about a congregation or prayer. There’s a lot of things that can only be accomplished in downtown that couldn’t be accomplished in a regular community setting,” he said. Levin also records a short Torah lesson every day called “One Minute of Torah,” which he sends to a few hundred people via text message, Whatsapp and Facebook. He said it’s for those people who can’t break away from work long enough to pray. That way, they get at least a little Torah in their day. Levin is 38, with a boyish grin that belies his wiry black beard and the silver hair that pokes out from underneath a black hat. He was born and raised in Worcester, Mass., and studied at yeshivot in France, Mexico, Australia, Italy and Brazil, as well as in New York, Miami and L.A. His wife, Chanie, is a teacher at a Chabad preschool, and they have six children. He is also the rabbi of Bais Bezalel, a Chabad congregation in the Pico-Robertson area. He said the two locations meet different needs. Even though the morning service begins at 9:45 a.m., people stream in and out over the course of an hour. Each congregant prays at an individualized pace. Some race through the service while nervously glancing at their watches or cellphones. The rabbi discussed all this one recent day at Cohen Restaurant, a glatt kosher Persian eatery next to Santee Alley, the famously frenetic shopping area. But unlike the chaos and noise nearby, the restaurant was quiet as he helped Somech wrap tefillin around his arm. Levin is there so often, the owners let him keep a spare pair of tefillin on top of a soda-filled refrigerator. 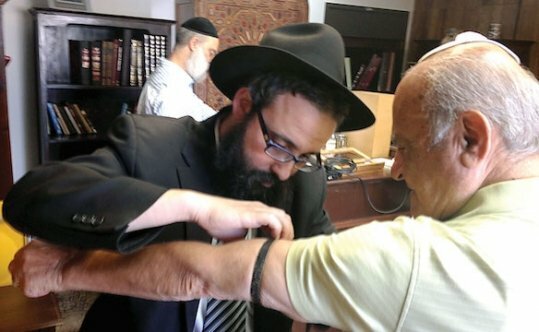 Levin said nonreligious Jews are often taken aback by wrapping tefillin. “After putting on tefillin for the first time, he’s wondering if he’s on ‘Candid Camera.’ So I point upwards, and tell him, yeah, the camera’s upstairs. It’s always watching us,” he said. Levin isn’t the only Chabad rabbi working downtown. Rabbi Moshe Greenwald runs Chabad of Downtown Los Angeles, near Seventh Street and Broadway. It primarily caters to residents of the neighborhood, rather than those who only work there. The two have known each other for a long time — Greenwald was a close friend and yeshiva roommate of Levin’s younger brother, Yossi. Ultimately, Greenwald said, the two are working toward the same goal.